This section gives you general information to help you decide on the boat type for your UK boating holiday. These boats are available for River Thames boat hire, and Caledonian Canal boat hire in Scotland. The modern cruiser boat is built from high quality resin mouldings, fitted out to provide excellent accommodation for relaxation, cooking, eating, and sleeping. These boats are cleverly planned to provide comfortable and even luxurious holiday accommodation for up to 12 people, depending on the boat's length. They are built to navigate without difficulty all the features you will find in your travels, from locks to bridges, so all you need worry about is which traditional pub, local attraction, or scenic spot to moor at! The boats in our extensive range do vary slightly so use our easy guide to help you pick the right boat for your holiday. All cruiser boats are steered through a steering wheel. The location of the steering means there are 4 main types of cruiser layout. Dual Steering: These very stylish boats have an inside forward steering position and an outside steering position on the upper deck. There are usually steep steps between the two positions. Forward Steering: Boats with a forward steering position tend to be on one level, with a door at each end. Some have a split sliding roof to open over the seating area on sunny days. Centre Steering: Boats with a central steering position tend to have a sliding roof over the saloon steering area for opening on warm days. The steering area is often raised giving better visibility. Aft Cockpit: These boats usually have a rear entrance to the cabin. Some have a folding canopy over the rear steering area which can be lowered for open air dining and steering. All our boats have reliable, quiet, smooth running diesel engines with enough fuel for two weeks cruising. All boats are fully checked before departure. The number of berths in each boat depends upon whether you wish to use only the fixed berths, or also utilise the convertible berths to give greater flexibility. A convertible saloon double allows a smaller cheaper boat than one where the saloon is not converted to sleeping at night, but this means that those sleeping in the saloon cannot go to bed until everyone else is ready. If in doubt, always go for more space, rather than less. So to get more space for 4 people, choose a boat with only fixed berths, or choose a 6-berth and leave the convertible saloon berths free. Bunk beds may be offered in boats designed for larger numbers of people. Some boats have one toilet and shower shared between the cabins. Others have a toilet and shower per cabin - this extra facility is reflected in the hire price. The distance covered in your holiday depends upon how long you wish to spend cruising each day. On average, four hours of cruising a day enables you to cover about 80-100 miles in a week with plenty of time for going ashore. If you have a specific route in mind this may affect the time of year you would like to travel, especially in the UK when early evenings in March, April, September and October can mean cruising is difficult after 4pm. In the summer months you should have no trouble in sailing until 8pm, if you wish to! 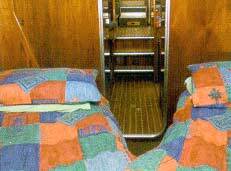 Comfortable beds or bunks with foam or interior sprung mattresses. Galley (kitchen) equipped with cooker, fridge, crockery, cutlery, pans. CD player, video, and/or radio cassette on some boats. Freezers and microwaves on luxury boats. The star rating will give you a guide to the level of equipment found on the boats. For example, a five star, four berth boat is more likely to have two fixed double beds and two bathrooms/toilets, whereas a two star, four berth boat will usually mean converting the dining area into a double bed, and will only have one bathroom. Microwaves, freezers or even dishwashers are only likely to be offered on five star boats. When you carry out a search on this website to find suitable boats you will see that the results provide details of the boats. Clicking on a boat name gives additional information. The traditional steel narrowboats are available on the canals of the UK. Go to our Canal Holidays Guide or Choosing a Canal Hire Boat.